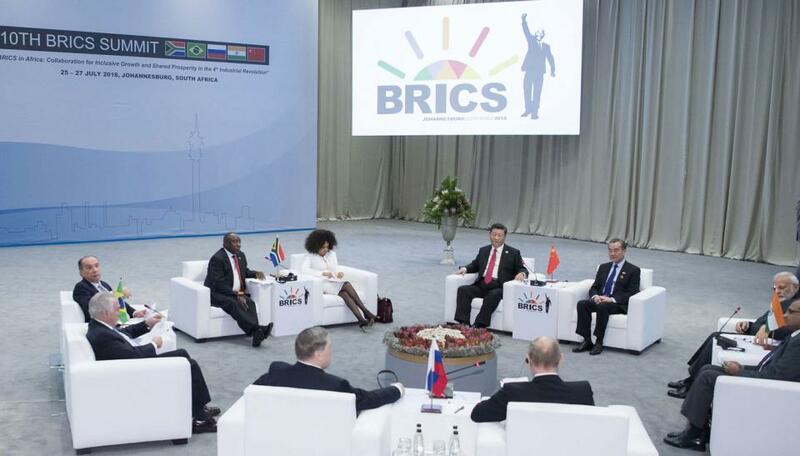 Chinese President Xi Jinping attended the 10th BRICS (Brazil, Russia, India, China and South Africa) summit held in Johannesburg, South Africa on July 26, where he called on the BRICS members to jointly safeguard “multilateralism” and strengthen cooperation within and outside the bloc, drawing on a concept he first proposed last year called “BRICS+. In his speech, Xi said the world was undergoing a deeper and more violent technical and industrial reform that required security and cooperation. As trade protectionism and unilateralism are directly impacting emerging markets and developing countries, he said, it is of great importance to expand space for mutual development through deeper and more extensive cooperation between nations. Xi proposed BRICS+ at last year’s BRICS summit in Xiamen, Fujian Province, in September 2017. According to Xi, the “+” not only denotes the inclusion of more developing countries – during last year’s summit Xi invited several nations from Latin America, Africa and Asia to join the talks – but deepening and improving ties to achieve an “innovative, safe, green, and open” environment for sustainable co-development. Xi fleshed out the detail of what he called the second “10-year golden era” of BRICS at the 2018 BRICS Business Forum on July 25, where he claimed the next 10 years would be a key period for global governance and economics to be reshaped, challenged by myriad technical innovations and the resurgence of protectionism and unilateralism, and that only openness and “win-win cooperation” could enable developing countries, especially those least developed, to join the international division of labor and share the benefits of a sharing economy brought by globalization. between developing countries initiated in 2003. “We have to seize the chance to exploit more potential for mutual cooperation and gain superiority for development... We have to jointly safeguard trade multilateralism, establish an open world economy and increase speaking rights for developing countries and emerging markets,” he told those present. “No matter how China develops in the future, it will always be a developing country that strongly supports the development of all other developing countries and concentrates on building closer partnerships with them,” he added.